We are in the midst of Chinese Ghost Month. It’s the 7th lunar month (August 11th through September 9th in 2018) of the year. The gates of the underworld open on the 1st day of the 7th lunar month and close on the 30th. During this time, ghosts and spirits of the departed wander the earth. It’s the only time of the year when they can freely leave the underworld and move among the living. Traditionally, Chinese believed this month was particularly dangerous. There would be more disasters than normal, both natural and man-made. The spirits, called Hungry Ghosts, roam the world seeking revenge and trying to find a living person to replace them in the underworld. Today, many still encourage extra caution during this month. Older people and children, for example, should not go out at night. Everyone should be careful to avoid needless risks. Who are these ghosts? Everyone who has died will not become a wandering ghost–only those who died in unhappy circumstances, such as people who are guilty of a crime, committed suicide, or died violently or prematurely. The ghosts travel the world looking for food and entertainment. To keep them from causing too much mischief—in case they are disappointed with what they find—people put out food, ghost money (also called joss paper), papier-mâché renditions of items the ghosts need in the afterlife (clothing, furniture, etc. ), and burn incense sticks. The most important day for offering sacrifices to them is the 15th day of the 7th lunar month. It’s called the Hungry Ghost Festival (the Zhongyuan Festival). It is on this day that the grandest celebrations/sacrifices are offered. This year (2018) the Zhongyuan Festival day is August 25th. In the past, to appease these lost souls and ensure safety for the living, families and communities would burn paper money (called ghost money because the ghosts could use this money in the netherworld) and hold open-air banquets with theatrical troupes providing fun for the spirits and the human guests. Buddhist monks and Taoist priests also performed ceremonies to alleviate the ghosts’ suffering. All of these activities, by families, communities, and the temples, were to placate the spirits. That is, once the spirits have eaten the food and enjoyed the entertainment, they should not cause trouble. After all, it would not be polite to hurt someone who has just shown you such generosity! Many families and communities today still remember the wandering ghosts in this way. For a selection of ghost stories based around this tradition, read A Banquet for Hungry Ghosts: A Collection of Deliciously Frightening Tales by Ying Chang Compestine. It’s for children, but everyone, no matter the age, will enjoy it. The Chinese American Family organization has a wonderful site with lots of information on this special month. They also have crafts and other ideas for families to learn more about the Hungry Ghost Festival and Ghost Month. http://www.chineseamericanfamily.com/hungry-ghost-festival/ . If you do anything special during this month or on the Zhuangyuan Festival, I’d love to know what you did. It’s spring and very, very wet. Finally, after days of rain, we have sunshine for a couple of days before more rain. All of this rain makes me think of umbrellas. Obviously, they are a wonderful tool for walking outdoors on rainy days, but when we were in Taiwan many years ago, I also discovered how useful they were for creating a patch of shade in the hot, burning sun. Umbrellas. 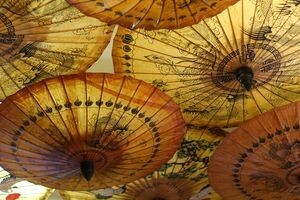 According to Joseph Needham,[i] while umbrellas, as sun-shades, were known in Greece and Rome times, the collapsible mechanism we take for granted probably came from the Chinese. How far back into Chinese history the umbrella goes varies a lot. Some claim it was first invented somewhere around 3000-3500 BC,[ii] but it certainly was around by the Han Dynasty (206 BC – 220 AD). 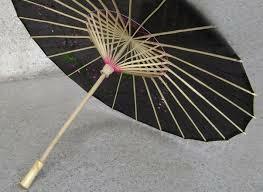 Early on, umbrellas were made of paper and silk and were sun-shades. Because they were expensive, they were a status symbol of the upper classes and the royal family. These early umbrellas had four parts: the head, handle, ribs, and shade. The frame was of mulberry bark and bamboo and the silk or paper covering became a canvas for works of art. In time, the umbrella evol ved: First, the paper shades were covered with an oil to make them impermeable to rain and expanding their use. But the really remarkable thing about these early Chinese umbrellas was how they evolved from a fixed frame to a collapsible frame. These co llapsible umbrellas worked by means of sliding levers, pretty much the same as we use today. 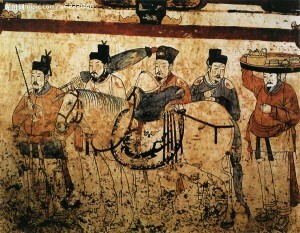 The first indication that the Chinese umbrella could be collapsed was in 21 AD, during Wang Mang’s reign as the first and only emperor of the Xin Dynasty. [iii] This umbrella was to protect the Emperor as h e rode in his four-wheel, ceremonial carriage, so it was quite large. The mechanism was so new and innovative that it was a secret. Besides the collapsible frame, the handle had bendable joints, allowing it to be extended or withdrawn. Needham does go on to say that there is some evidence that the mechanism had been developed as early as the Zhou Dynasty (around 600-500 BC). If so, it was probably invented by a woman named Yun shih, the wife of an artisan. Truly a remarkable history for our simple, and much-needed, umbrella! 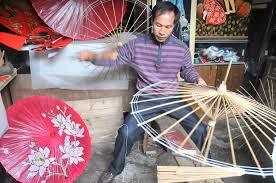 The next time you open up your umbrella think of its long past and its country of origin: Ancient China. [i] Joseph Needham Science & Civilisation in China, Volume IV:2, pp. 70-71. 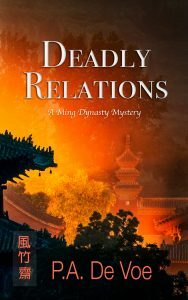 Judy Penz Sheluk is a wonderful mystery author who also does a blog on authors and mystery novels. Today I’m delighted to say that I was included in her “Before They Were Authors” blog. I hope you enjoy it and leave a comment. CHINESE NEW YEAR 2017, WHAT DO PEOPLE DO BESIDES EAT? First, before I go into this New Year’s blog. 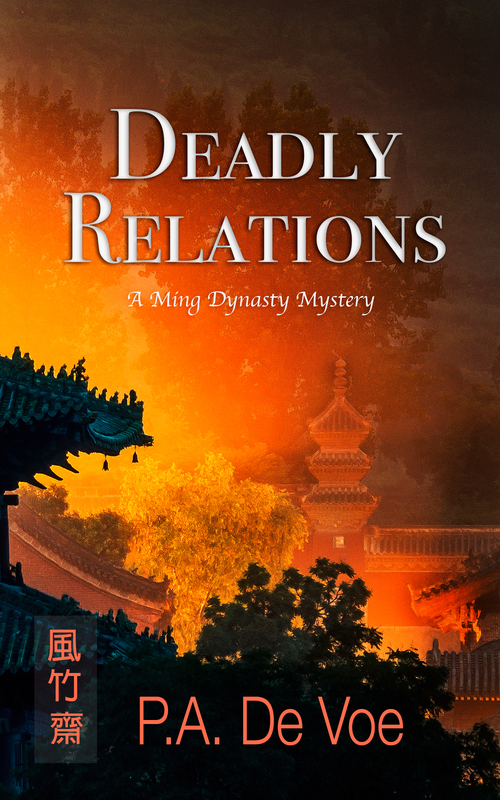 I am so excited because yesterday I found out that Trapped, a Mei-hua Adventure, the thir d novel in the ancient China trilogy, has been nominated for an Agatha Award. The Agatha Award is given to mysteries that hold to the standards of Agatha Christie and her work. I am honored to be among such a wonderful group of other nominees for this award. Now for this week’s New Year’s blog. Before New Year arrives, the house is cleaned from top to bottom. By cleaning the house, the family is getting rid of any bad fortune they may have had last year. BUT they do not clean the house during the first couple of days of the New Year because then they could be sweeping away the New Year’s good luck. So: once the New Year comes it’s time to relax and enjoy, their work is done! Adults give red paper envelopes to children. Inside the envelopes is a New Year gift of money. How much isn’t important, but it’s always in a red envelope. At the entrance people hang long red paper strips with good luck sayings written on them. 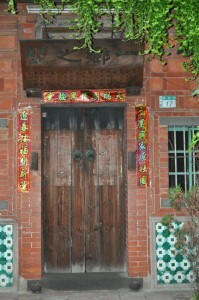 The good luck couplet is also visually balanced by being divided into two strips, one on each side of the door. and the saying is usually visually balanced, too. 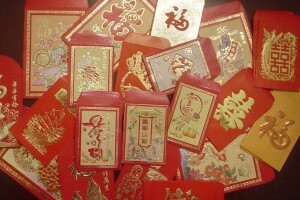 Red paper-cuts (usually square in shape) with the year’s animal—the rooster this year—or other good luck symbols (wealth) are pasted on the windows and doors. A popular word is fu for good fortune or happiness and it’s hung upside-down to represent the good things flowing into the house. Families go to temple fairs where they can watch puppet shows. These shows can be seen almost every day throughout the New Year period. Setting off firecrackers—much like our 4th of July on steroids. Both public and private fireworks are set off all over. Everyone participates. On the more serious side, is when the family comes together to honor their ancestors. They may clean the tombs, and they may also cluster together before pictures of their deceased relatives to show honor and respect. By participating in these activities as a family they are stressing that they are united by blood and are a cohesive unit. Anything with the number 4 in it because 4 sounds like death and is, therefore, an extremely unlucky number. Cut flowers because these are generally given at a funeral, so—obviously—not auspicious! White or yellow flowers, which represent death. Just choose a plant in another color. Mirrors are thought to attract malicious ghosts—something no one would want to do. Plus, mirros are easily broken and anything broken is a bad omen. 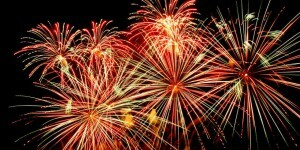 This is a time of great celebration and joy, just avoid anything that implies death, breaking relationships, or bad luck. the door in Taipei = interest.com/pin/80361174572834867/; the red envelopes = I couldn’t find the source again; fireworks = pop.h-cdn.co. It’s spring and I’m beginning my gardening in earnest. We have a fairly large flower/native plant area, which—hopefully—both the wild life and we can enjoy together. In looking at a picture our brother-in-law took of my husband and me in the garden, I realized that I was wearing a distinctive t-shirt our daughter gave me. 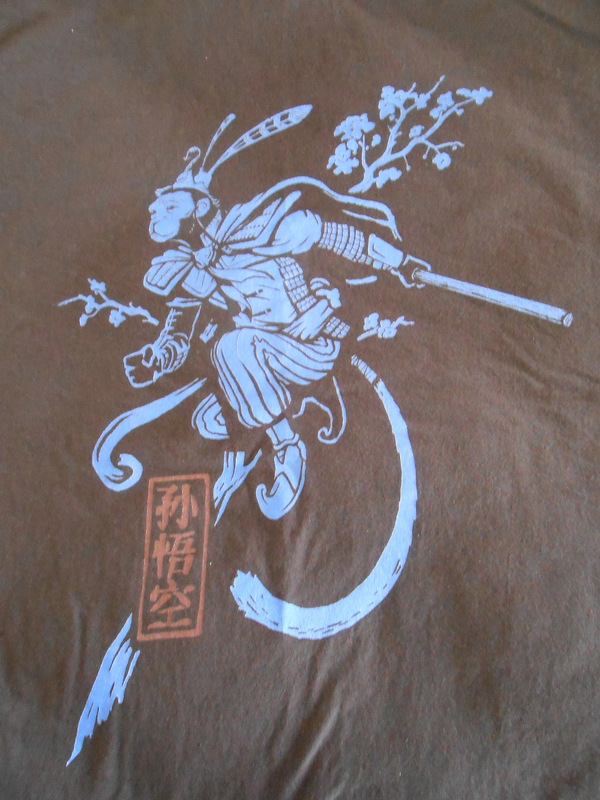 Emblazoned on the front is an image of Monkey King, Sūn Wù-kōng, Sun Wuh-kong 孫悟空. We’ve just celebrated 2 rather high profile Chinese holidays: New Years and the Lantern Festival. Most people know something about these holidays. 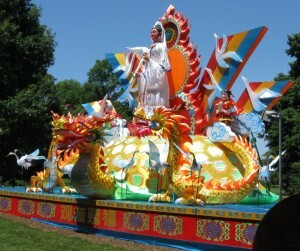 They are fun, colorful, and celebrated by Chinese and non-Chinese around the world. This picture was taken at the St Louis Missouri Botanical Gardens in 2013. But there are many other less known festival days that are tied to traditional Chinese culture. Some of these are tied to China’s solar calendar, some the lunar calendar, and some have become intermixed. One such holiday may be 驚蟄 Jing zhe, Insects Awaken. The holiday comes in the 3rd month (note People’s Daily Online). I believe this festival is also called the Shangsi Festival [上巳 節 shàngsì jié, shanghsih jier], which today officially lands on the 3rd day of the 3rd month of the lunar calendar*. Traditionally this began the farming season in most of China. It is said that the thunder of spring rains awaken the insects who have been hibernating all winter. There are a range of activities to mark this day, such as a sacrificial ceremony held near water where people could clean themselves and rid themselves not only of dirt but also of last year’s bad luck. 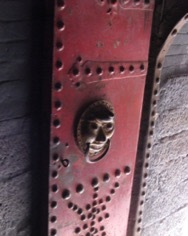 Driving out evil and bad luck is a critical part of this festival. Wormwood was hung in homes to drive out insects, rats and snakes. Celebrants also called back the spirits of relatives and awaken their own spirits. And, as often happens, people would go outside and enjoy picnics and hikes. After all, winter was over, the spring rains had started and there was new life everywhere. Another custom the People’s Daily mentioned was that in some areas the white tiger was honored. This was done to avoid disputes during the coming year. If someone angered or displeased the tiger, that person would have conflicts with others during the year. I especially like this story because it exemplified how important maintaining peaceful coexistence with your neighbors and family was. As we said in the last post (January 3, 2014) the radical makes up an essential part of a character but there often is a second part, which usually gives further information. The word butterfly, hú dié, hur dier (蝴 蝶) is a great example. The first word in this combination is hú, hur (蝴).